The Moto X smartphone might have been the last phone to come out of Google’s ownership of the company, but that does not mean in any way that it is the end of the road for the smartphone. A Moto X successor might be in the works and it might be called the Moto X+1 according to a leaked image of the branding that surfaced on Twitter. 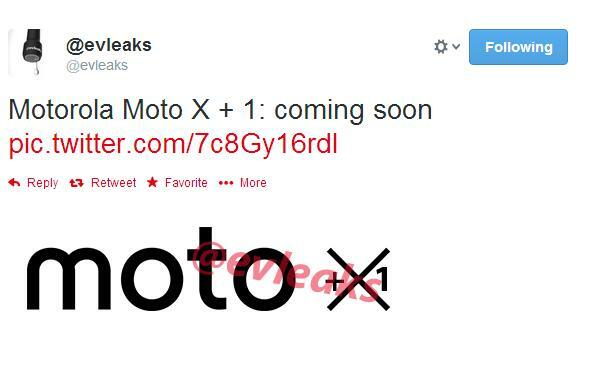 Serial leaker @evleaks has posted on Twitter that Motorola Moto X +1 might be coming soon. Evleaks hasn’t posted any images or provided any specs of the device, but from recent history, you can deem it’s leaks with a little trustworthiness. This would be the first smartphone coming out of Motorola since Lenovo bought the company. A sequel to the other Motorola smartphone in the market – Moto G called the Moto G Forte was launched last week in Mexico.